Make your children happy by adorning this set of table and chairs in their play and study room. Constructed of wood veneer and solid woods that provides a long age to the product. The table features round shape with an open shelf and a drawer while the chairs feature slatted back that provide comfortable seating. 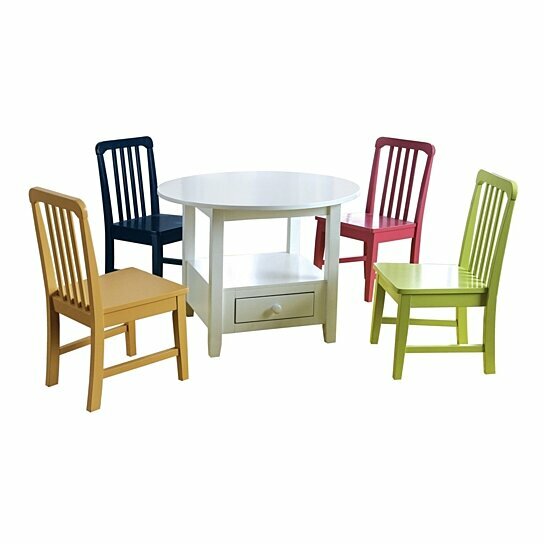 This beautiful multicolor set of table and chairs will look elegant with any decor style. The set consists one table with four chairs. The table features one drawer and open shelf while the chairs featuring slatted backrest. Ideal for the kid's study room or play room.